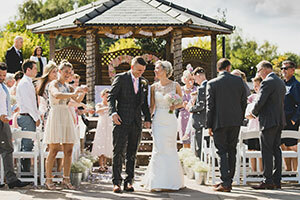 With just a few dates remaining in its May and June 2019 diary for weddings, Aston Marina has launched a special package for couples seeking a last-minute venue for nuptials early next summer. The comprehensive ‘Early Summer Sensation’ package will be available on all remaining May & June 2019 dates and could see a complete wedding cost as little as £5,995. The glamorous offering includes exclusive use of the Boat House and its grounds for the ceremony and reception; a glass of strawberry-topped sparkling wine or beer for guests on arrival; a 3-course wedding breakfast with tea/coffee; a bottle of red and white wine for each table during the meal; Prosecco to toast the speeches; an evening pizza buffet with spiced wedges, mixed salad and coleslaw and DJ for the evening entertainment. The price covers up to 40 guests during the daytime and 70 for the evening party, with couples able to add additional day and evening guests for £65 or £20 respectively. In addition to a ready-made wedding, couples will enjoy a beautiful backdrop for their big day – the Boat House is a light-flooded, modern space whose minimalist design lends it perfectly to almost any theme. The neighbouring marina and beautifully landscaped grounds, meanwhile, offer a beautiful location for wedding photos – with the option for couples to marry outdoors in the dedicated outdoor ceremony space. Couples keen to discover more should contact the events team on 01785 819702 or email info@astonmarina.co.uk to organise a viewing.